Washington (CNN) – Hillary Clinton has firmly planted herself with the White House and those who say the United States should not provide military assistance – particularly airstrikes – to the Iraqi government in response to the rise of the Islamic State of Iraq and Syria and other militants. In both lengthy remarks at a George Washington University book event and an interview with the BBC on Friday, Clinton blasted Iraqi Prime Minister Nuri al-Maliki and the current state of Iraq that, she argued, allowed radical Islamist militants to surge through the country and threaten the capital Baghdad. Clinton characterized the Maliki government as "dysfunctional, unrepresentative, authoritarian" in front of an audience of 1,500 in Washington. For that reason, she added – to sustained applause – that "there's no reason on earth that I know of that we would ever sacrifice a single American life for that." "We certainly don't want to fight," Clinton added. The jihadist group, known as ISIS, wants to establish an Islamic caliphate, or state, in the region. It has already had significant success to date in Syria, where it has fought against President Bashar al-Assad's government as well as other rebel groups in a bloody civil war, and in Iraq, where its fighters recently took over Mosul, the nation's second-largest city. Iraqi Foreign Minister Hoshyar Zebari told CNN on Thursday that the army had "collapsed, basically" around Mosul, causing commanders to flee and the city to fall into the jihadists' control. Clinton, whose support of the 2002 Iraq War Resolution has hung with her for more than a decade, said that the fact that army abandoned its posts was evidence that the United States should not consider airstrikes "at this time." "You don't have a government that can inspire loyalty even among its army," she said. "It's a recipe for a horrendous conflict." Although Clinton focused much of her attention on Maliki in describing the current state of Iraq and the reasons against military action, the Iraqi leader only gets one mention in Clinton's memoir "Hard Choices." On Friday, President Barack Obama stressed again that he "will not be sending U.S. troops back into combat in Iraq," but told reporters that he is asking his national security teams to come up with other options. The president said, however, that it was up to Iraq's leaders "to make hard decisions" on the future of their country. U.S. officials have discussed bolstering ongoing efforts to send arms, equipment and intelligence information to help Iraq and its military. Airstrikes are among the options being considered, White House spokesman Jay Carney said. Earlier on Friday, the BBC released a 20-minute interview with Clinton, where the former secretary of state said airstrikes in Iraq were not appropriate "at this time." "That is not a role for the United States," Clinton said. "There needs to be a number of steps that Maliki and his government must take to demonstrate that he is committed to an inclusive Iraq – something he has not done up to date." Clinton also said that the Iraqi Army – "which has not been able to hold territory" – needs "an injection of discipline and professionalism" before any help could be considered. Clinton ruled out troops on the ground during her interview with the BBC, saying that is "not going to happen... at any foreseeable future." The former secretary of state, however, would "never say never" to troops on the group because "the world is so unpredictable." Clinton's history with support for the Iraq War has defined much of her political career and her 2002 vote to give then-President George W. Bush the authority to go into Iraq was "probably the hardest decision I have ever had to make." During the 2008 Democratic presidential primaries, Obama – who was against the war – used Clinton's support as a bludgeon to hammer her campaign with liberal Democrats. In her recent memoir Clinton writes that she "should have stated my regret" on Iraq "sooner and in the plainest, most direct language possible." "When I voted to authorize force in 2002, I said that it was 'probably the hardest decision I have ever had to make,'" she writes. "I thought I had acted in good faith and made the best decision I could with the information I had. And I wasn't alone in getting it wrong. But I still got it wrong. Plain and simple." - CNN's Laura Smith-Spark and Ashley Fantz contributed to this report. Hey Hillary, I see you can back pedal very well. Try going forward for once in your lousy life you nasty old woman. "The Senate Democrats COULD have stopped that invasion, if they had to guts to stand up against Bush. If Hillary couldn't stand up to, or see through, W's lies, how can we expect her to handle Putin?" What with the obsession with Putin? He's nothing. Russia is in abysmal shape economically and militarily and has been essentially reduced to a regional power. Their currency performed worst amongst all major industrial nations last year. His wang waving in Ukraine is specifically designed to pretend otherwise, to present a show of force and strength to hide his country's weakening position behind some bravado, but in a manner in which he knew very well nobody could really do anything about. Now, the sanctions for his behavior are making it worse economically for Russia. We have nothing to fear from him. He has no designs on us other than trying to recapture status as an equal, which he desperately fears Russia is losing. Stop clinging to the Cold War. My point is simply that you have to take into consideration that what they believed at the time was based on what they were told, and they were told KNOWING lies. and your proof of this is what??? oh, you have none. so it is you that are knowing posting lies. There is a part of me that enjoys seeing the unbridled irrational anger leveled towards her. She is really worrying a lot of radical right folks. Go Ms.Clinton. You must be on the right track! Oh and ivan, if in fact you did fight for OUR country, thanks for your service and welcome back home. Sniffit – " ... to be held appropriately accountable "
And to my mind " to be held appropriately accountable " means acknowledging that Hillary is not qualified to be President. Naive or gutless, we can do better. I want a leader who takes making war, and especially an unprovoked invasion of another country, as the most serious duty of the President. Or a Senator enabling the President. 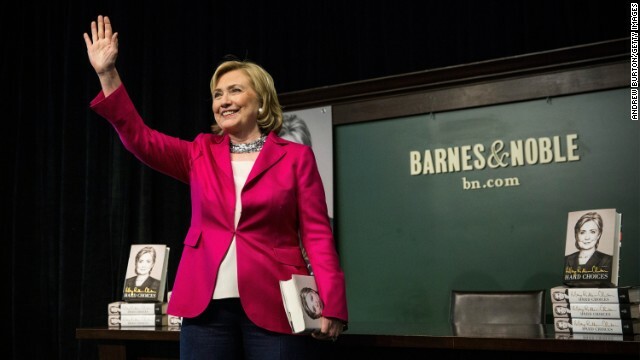 "The book pandering road show of Hilary – What Difference Does it Make – Clinton continues... and nobody cares." Really? It's been the single most talked about thing in the MSM all week and you're saying "nobody cares"? LOL. The bubble is an evidence free zone. The only people excited about the content free book are the lefties that now have the opportunity to grill Hillary Clinton and make her squirm and attack. The far left Democrat Party has started its attack on Hillary already. And her poll numbers are falling faster than cities in Iraq. My Fridays haven't been the same since this promotion that has kept me away from you and the rest of my buddies on this thread. I wish you a safe and happy weekend mys ister friend. Keep up the good fight, and tell "ivan" that I said thank you for his service and welcome home. "My point is simply that you have to take into consideration that what they believed at the time was based on what they were told, and they were told KNOWING lies." WE were certainly told we were heading into Iraq to find those pesky WMDs. One suspects that our congress people were given an even more harrowing doom and gloom scenario than the public was given. They were, after all, being called upon to vote for the invasion. Time to bring back the draft so all you armchair heroes can shut the hell up. Very easy to talk about troops on the ground and bombing this and bombing that when you've got no skin in the game. So civilians get to dictate US Policy, now? She needs to stay with her book signing tour. For as a Sec of State she left 4 Americans to die, and today there are still just under 10,000 U.S. Troops there, I guess she is willing to sacrifice them so that TERRORIST can continue killing, or worst they could take the Americans HOSTAGE and force more TERRORIST held in GITMO to be released. Perhaps that's what her objective is. I think Hillary should be sent to Iraq as a goodwill ambassador from the US..... "Really what difference would it make" if she didn't come back? Isn't she a private citizen? Regardless why or how we ended up in Iraq, under what pretence. Which I state here and now we should have not gone there. Even though Saddam killed his own people by the thousands, he kept them under control. Think of how many more will now die by other Irag hands and total chaos. We need to fininsh what we started otherwise it will be a new strongthold for Terroists.